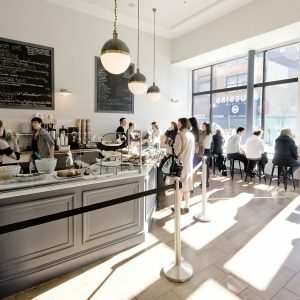 Bluebird Kitchen in Pittsburgh’s Downtown neighborhood strives to make food on the go delicious, healthy, and exciting. With two locations on Forbes Avenue and Stanwix Street, Bluebird Kitchen is right in the heart of the city. Founder, Liz Moore, brought her passion for great food back to her home in Pittsburgh where she wanted to help build vibrant communities and a healthy environment within the region. Bluebird Kitchen offers fresh foods and high-quality beverages for breakfast and lunch—all prepared in house daily! The creative culinary staff use local, seasonal ingredients to create flavorful menus pleasing to any palate. Their small menu is anything but ordinary—breakfast sandwiches, oats, biscuits and gravy, salads, hot sandwiches, and smoothies are just a few of the tasty items available regularly. Their selection of cookies, muffins, and other baked goods are sure to satisfy any sweet tooth. They also have a special menu only available on holidays, and Bluebird Kitchen also offers catering services and delivery to Pittsburgh locations. The Forbes Avenue location of Bluebird Kitchen earned a Silver designation with the Sustainable Pittsburgh Restaurant program in 2015. This designation means that the café practices a number of sustainable actions each day that contribute to the health and resiliency of the region. To limit the amount of waste they are producing, Bluebird Kitchen sells their used cooking oil to Valley Proteins to be rendered into biodiesel, they prioritize disposable wares that are both recyclable and made from recycled content, and they even offer a discount to customers who bring their own multi-use coffee mugs instead of using a single use cup. To learn more about Bluebird Kitchen’s sustainability efforts, you can view their profile and read their complete designation report. Interested in some healthy and delicious food, fast? Head in to Bluebird Kitchen, located Downtown at 221 Forbes Avenue and 11 Stanwix Street. The Forbes Avenue location is open Monday through Friday from 7am to 3pm and Stanwix from 7am to 2pm.